Elevate your Firenado gas log set with included fire glass! Authentic, realistic and natural... just some of the words that describe the Firenado 24 Inch Charred Oak Gas Log Set. The patent pending Firenado burner features a unique triple spiral burner design that is constructed of durable and rust resistant 304 stainless steel. The spiral design of the burner heads allow the gas to be delivered to a variety of locations throughout the burner pan, re-creating the depth of a real fire. This enhanced depth, along with the full yellow flame, allows the Firenado burner to deliver a truly natural and unmatched flame appearance. The patent pending spiral design not only creates an impressive flame, but also provides more heat than a traditional gas log burner due to the excellent gas coverage. If all of that isn't enough, the Firenado burner is backed by a lifetime warranty, so you can rest easy knowing this burner was built to last. The Firenado Charred Oak gas logs are the product of a multi-step hand-painted process. The logs reflect the ultimate in detailing that truly sets them apart from the competition. Large, premium logs are cast from hand-picked real wood to provide unrivaled realism. These Firenado Charred Oak gas logs are designed with innovative burnt-through technology, creating a perfectly burned and charred look. This burnt-through technology allows this set to be quickly and easily transformed from a 24 Inch Gas Log Set to a 30 Inch Gas Log Set by varying the space between the two front logs. A relatively close proximity conforms to the traditional 24 Inch gas log setup while increasing the spacing towards the ends of the grate shifts the configuration to that of a 30 Inch gas log setup. Give your home the warmth and long-lasting beauty it deserves with the Firenado Gas Log Set. This set contains (9) ceramic refractory gas logs, including a log riser (used to elevate the rear log for more attractive stacking), the patent pending Firenado burner, sand granules, the glowing ember material, midnight-toned fire glass and the black-painted steel grate, as well as a 10 Inch non-whistling gas line and damper clamp. This gas log set is intended for use with natural gas only - not to be installed with propane. This set features a match light system that uses your existing wall key valve and does not include a control valve. 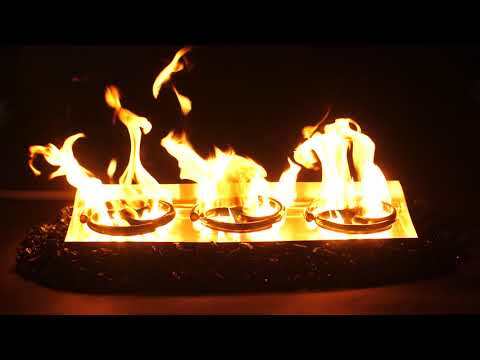 Firenado warrants this stainless steel natural gas burner for the lifetime of the original purchaser. The black iron grate is warranted against any defects in materials and workmanship, and deem suitable for residential use for a period of ten (10) years for indoor applications and two (2) years for outdoor applications from the date of purchase. All other parts are covered by a thirty (30) day warranty, excluding paint. Not intended for commercial use and will not be warrantied under commercial use. 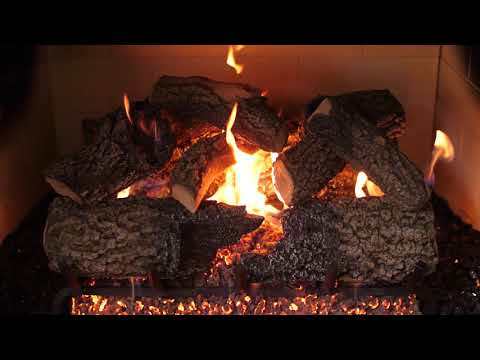 Firenado’s Charred Oak Gas Log Set will bring your fireplace to life. Its patent-pending spiral burner design creates an incredibly beautiful flame pattern, as well as, providing more heat than a traditional gas log burner due to the excellent gas coverage. This gas log set comes with everything you need, right in the box. It comes with sand, glowing embers, and even midnight-toned fire glass to add some sparkle and enhance the look. With its realistic, hand painted details and burnt-though look, you’d swear it is real. The burnt-through front log allows this set to be customized from a 24-inch gas log set to a 30-inch making it incredibly versatile. If you have a small fireplace, keep in mind that the Firenado Charred Oak is currently only available in 24” and 30” configurations. It also only comes in the match light ignition method and cannot currently be upgraded.